An $8.8 million emergency project to repair a failing slope between a busy roadway and the Kalamazoo River was delivered months ahead of schedule, thanks to an innovative contract by Michigan Department of Transportation. The slope, located under M-222 in the city of Allegan (about 27 miles from Kalamazoo), had been deteriorating in recent years, showing signs of substantial erosion. Yet it wasn't until the heavy snowfall and its melting in the winter of 2010/2011 that MDOT realized it didn't have much time before the erosion would undermine the roadway, which was starting to crack. Recognizing the need to protect commuters from this dangerously eroding slope, MDOT made an emergency closure to M-222 in April 2011. In order to re-open the road as soon as possible, MDOT decided to use a Construction Manager/General Contractor (CM/GC) process, a contracting method in which the contractor is chosen by a qualifications-based selection process during the design phase to assist in the design development and initiate the construction before the design is completely finished. Because of this method, MDOT saved time and money as it was able to begin construction with only roughly 80 percent of the design plans completed. 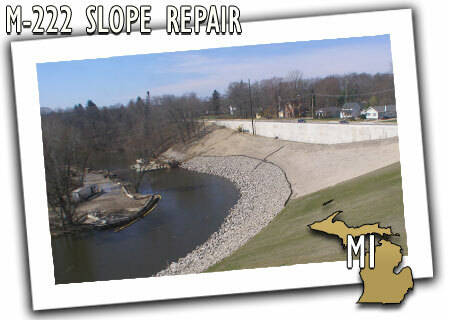 MDOT got to work, constructing a 525-foot long, 26-foot high retaining wall to treat a ground water seepage problem that was causing the slope erosion, and protected the slope from river erosion. The road was reopened to traffic on December 16, while the entire project is on track to be completed in May, a month ahead of its original completion date and many months ahead of what was projected without using the CM/GC process.